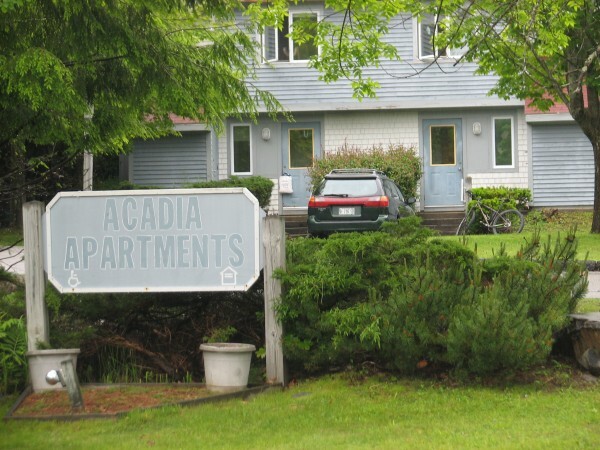 Acadia Apartments on West Street Extension in Bar Harbor was purchased in early June 2012 by resort lodging firm Ocean Properties. Residents of the subsidized apartment complex say the firm plans to use the property for employee housing and that they have not been told when they have to move out. BAR HARBOR, Maine — An international resort firm that owns more than 100 resort properties in North America has bought a local subsidized housing complex and told residents they will have to move out, according to people who live there. Several residents of the apartment complex said last week that Ocean Properties representatives told them at a face-to-face meeting that the firm plans to use Acadia Apartments, located on West Street Extension within walking distance of downtown Bar Harbor, as employee housing. The complex consists of four buildings with four apartments each, but not all of the apartments are occupied, residents said. Several recent attempts to contact Ocean Properties for comment about the acquisition have been unsuccessful. The firm owns several seasonal hotels in Bar Harbor, including Harborside Hotel and Marina, the Bar Harbor Regency Hotel and West Street Hotel, construction of which is nearly complete. According to a letter sent to Acadia Apartments tenants on June 8, 2012, the property’s new owner is BHAPTS, LLC. Contact information for the new owner provided in that letter and another sent June 11 include a phone number for Ocean Properties’ operations manager on Mount Desert Island and the resort firm’s corporate address in Portsmouth, N.H. The letters make no mention about the tenants having to move out. Residents of Acadia Apartments, all of whom receive federal housing assistance, have said they are unhappy they were told they will have to move out. Several residents interviewed last week said they hope to be able to stay at least through the busy summer tourist season, when housing of any kind can be difficult to find on Mount Desert Island. None of the Acadia Apartments residents interviewed for this story wanted to be identified. One woman said she heard Ocean Properties may provide tenants with financial assistance to help with their moving expenses and she does not want to jeopardize the possibility of receiving such funds. Several of the tenants at Acadia Apartments are single mothers with children. Another tenant who doesn’t work and takes care of a male relative said the prospects of finding housing this time of year on MDI, where a crush of seasonal residents and tourism-industry workers put housing and rent at a premium, can be daunting. “Nobody likes being told they have to move out of their home,” the tenant said. Another tenant said he has been able to find subsidized housing elsewhere, but he feels bad for his fellow tenants who don’t have the same options. He said the previous owner, Acadia Housing Corp., has been trying to sell the property for a long time but could not find any takers until Ocean Properties took an interest in it. More detailed information about how long the complex was on the market was unavailable Monday. Until earlier this month, Teresa McDonald managed Acadia Apartments on behalf of Stanford Management, which administered the complex and still manages Harbor Hill estates nearby. McDonald directed inquiries Monday about the sale of Acadia Apartments to a Portland woman who represents the owner. Attempts to contact the Portland woman Monday afternoon were unsuccessful. Terrance Kelley, executive director of the MDI Housing Authority, said Monday that some of the tenants at Acadia Apartments do get Section 8 federal housing assistance that is administered by his organization. He said the housing authority has not had any direct management role in the property but that the authority has contacted residents at Acadia Apartments this month to offer its help. Kelley said residents at the apartment complex who don’t already receive Section 8 assistance are welcome to apply for it or to apply to live in one of the subsidized housing properties owned by the authority, which include two in Bar Harbor that accept only elderly and disabled tenants, but not children. He said the only subsidized housing complex that the authority owns and maintains for families in Bar Harbor is on Woodbury Road. There is a waiting list for those apartments, he said. The MDI Housing Authority owns housing complexes elsewhere on MDI, in Southwest Harbor and Tremont, and in the Ellsworth area, Kelley said. Generally, subsidized housing in the area is in limited supply, he added. “There’s a few other ones, but not a lot,” Kelley said. Kelley said there are plenty of seasonal jobs on Mount Desert Island. Most of the working-age and physically fit people who live in the authority’s housing properties have two or three jobs in the summer, like many other people who live on or near MDI, he said. In addition to Harborside Hotel and Marina, the Bar Harbor Regency Hotel and West Street Hotel, Ocean Properties owns the Park Entrance Motel, Days Inn and Ledgelawn Inn in Bar Harbor. It also owns the downtown restaurant pier Stewman’s and Harbor Place, a commercial building next to the town pier that has several tenants. The assessed value of all of Ocean Properties’ local land holdings, which include several residential lots that abut its local hotels, is nearly $80 million. Follow Bill Trotter on Twitter at @billtrotter.